New York, September 10: With a surge in number of home owners defaulting on their mortgage payments, foreclosure filings in the nation crossed 300,000 for the sixth straight month, according to data provider RealtyTrac Inc.
A total of 358,471 properties received an auction notice in August, meaning one in every 357 U.S. homes received a filing. The foreclosures are up 18 percent from a year earlier and down 0.5 percent from July. “The August report demonstrates that there is still an ample supply of properties filling the foreclosure pipeline even while the outflow of bank-owned REO [real-estate owned] properties onto the resale market is being more carefully regulated,” RealtyTrac Chief Executive Officer James Saccacio said in a statement. 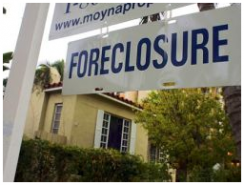 Despite a surge in demand in the U.S. housing market after a three year slump, foreclosures are not abating. The foreclosures are largely related to unemployment. With the unemployment rate at a 26-year high (9.7 percent), many home owners have defaulted on mortgage payments. Nevada witnessed the highest foreclosure rate last month with one in every 62 homes receiving a filing. Though there is an 8.4 percent drop in the number from July, foreclosures were up 53 percent from August last year. Next highest foreclosure rate was reported in Florida where one in every 140 households receiving a filing. Others in the top ten states for foreclosure filings were California, Arizona, Michigan, Idaho, Utah, Colorado, Georgia and Illinois. A 9.6 percent drop in default rate has helped Arizona lower its foreclosure rate to fourth-highest in August from third-highest in July. In an effort to prevent foreclosures, the administration has launched Making Home Affordable program. Under the program, lenders are paid to reduce borrowers’ monthly installments. Though a number of families have been able to modify their loans, progress is very slow and more foreclosures are expected, according to the Treasury Department. Rick Sharga, senior vice president at the Irvine, California-based company, stated that RealtyTrac is revising its estimate for foreclosures this year. Approximately 3.4 million households will get a default notice this year, up from the prior estimate of 3 million to 3.2 million, and higher than 2.3 million foreclosures last year. Rick further added that the numbers are high due to two concurrent problems of high loan defaults, which resulted from laxity in banking regulations, and highest U.S. unemployment rate in 26 years.